As some of you may know, I worked at HQ from 1991 to 1999 and during that entire time the HQ leadership had been working at “re-engineering” corporate structure (I think they were calling it “re-entrenchment” or some such euphemism, to avoid panicking the huddled masses), and re-evaluating our overall church culture. I know that at every General Council a report is presented evaluating the overall spiritual climate of the Fellowship, but I think there’s been a particular pointedness to the internal naval-gazing ever since Margaret Poloma came to HQ to research her book, The Assemblies of God at the Crossroads: Charisma and Institutional Dilemmas. —Margaret Poloma, ‘The Assemblies of God at the Crossroads: Charisma and Institutional Dilemmas,” Christian Century, (10/17/90), pp. 932-934. Now, with Trask’s program, “Vision for Transformation,” well under way, my good friend (and former boss), Tim Strathdee, has been used by God to usher in a change that some might call miraculous–if it truly does have an impact on corporate culture. 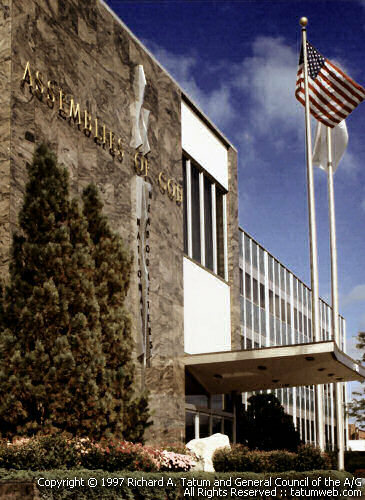 How one CIO’s budgeting blues led to an organizational revamp at Assemblies of God. Tim Strathdee, a kind and gentle soul by any account, ruthlessly pitches 99 percent of all junk mail that hits his inbox. But in August of 2002, the CIO of the Assemblies of God (AG) U.S. headquarters in Springfield, Mo., was gearing up to prepare his budget for the coming fiscal year, an annual exercise in frustration. So when he saw a mailing about a variation of activity-based costing, he opened it. Read it. And then called the author, Dean Meyer. Strathdee was dreading budget season because the AG process followed a typical cost-plus model, in which a department’s annual budget is based on the previous year’s amount, plus a percentage for inflation or other factors. Once approved, a cost-plus budget, which remains the predominant method of budgeting in corporate America today, functions as a checkbook to which no funds can be added. Strathdee was evaluated primarily on whether he stayed within budget, not on how much value he provided to his customers. So when departments wanted IT’s help to launch new initiatives, he could do no more than add their requests to his growing queue and hope that he could pilfer money from somewhere else in his ever-so-fixed budget. Before changing the company’s culture, Assemblies of God CIO Tim Strathdee was evaluated primarily on whether he stayed within budget, not on the value he delivered. But what began as a conversation with Meyer about building a more value-driven budget for the IT department would ultimately turn into a multi-year project to transform the budgeting process of the entire AG headquarters’ operation—and its organizational structure, work-flows and even its culture. Along the way, Strathdee’s role would morph from catalyst to design team committee member to behind-the-scenes thought leader. While the goal of supporting missionary work is unusual in some ways (for example, few corporations begin and end each meeting with a prayer), many of the organizational issues that AG leaders wrestle with are no different from those facing the most profit-driven companies publicly traded on Wall Street. Companies fret about losing customers; AG leaders were scratching their heads over a slowdown in church growth in the late ’90s. AG’s Gospel Publishing House, which produces more than 16 tons of literature a day, was facing declining revenue. Field reps met with increased competition as they marketed everything from Sunday school curricula to magazines for the Royal Rangers and Missionettes (AG’s version of Boy Scouts and Girl Scouts) to more than 12,000 independent-minded, self-governing AG churches across the country. General Superintendent Thomas Trask, AG’s CEO-equivalent, worried that the relevance of AG’s products and services was diminishing. And since publishing sales cover 65 percent of the headquarters’ operating expenses, that was a problem. Communication suffered; duplication of efforts (including multiple purchasing functions and editorial groups) was rampant. The cost-plus budgeting process, which many managers delegated to their subordinates, exacerbated the problem, since there was no mechanism to review whether existing programs were worth sustaining. Once funded, most programs were simply continued. Frustrated by his inability to climb out of the maintenance trap and meet requests to fund new development, Strathdee called Meyer, author of the activity-based costing tract that had piqued his curiosity. But the conversation surprised him. After Strathdee described AG’s broken budgeting process, Meyer quickly (and correctly) surmised that there were deeper issues: The organization was stuck in maintenance mode, even flirting with irrelevance. He suggested that AG step back and look at these larger problems. The organization was, in fact, attempting to do just that. Trask had launched a Vision for Transformation (VFT) effort in 1998. After AG churches arrived at a common spiritual vision for the church, the VFT focus turned to a review of headquarters’ operations in spring 2002. The review committee “met, and frankly, we didn’t know where to start,” says Strathdee, a committee member. “So we just scheduled another meeting for later.” But after his conversation with Meyer, Strathdee introduced Trask and other top executives to Meyer’s RoadMap process. They soon decided it was the blueprint for VFT. Meyer’s RoadMap is a diagnostic based on systems thinking (see “The Five Facets of Every Organization”). The RoadMap helps organizations document a clear vision, analyze the gaps between vision and reality, diagnose the root cause of problems and then outline a leadership plan to achieve the desired outcome. By January 2003, Meyer had signed on as a consultant, and the VFT committee had changed its name to the RoadMap Process. A VFT design team, comprising 42 managers from all functions within the organization, began by soliciting input from employees on how headquarters operated. Just over half, about 600, participated at several gatherings that spring, which Sallee characterizes as “good venting sessions.” Breakout sessions on hot topics allowed for deeper discussions, and every single comment was documented on a Post-it note. Sallee would later invite employees to e-mail their concerns to culture@ag.org. He says the first batch of e-mails was “vindictive and hurtful,” but employees toned it down after he asked for more constructive criticism. The design team reviewed all comments, pulling from them five particular trouble spots: partnership with customers (both internal and external), resource management, product design, operational services and people management. They mapped every Post-it note to one of the challenge areas. Ironically, the extreme cordiality of the staff (a.k.a. Midwest Polite) was part of the problem. “Sometimes being polite to one another can be detrimental,” Meyer says. “Organizations may avoid conflict to the point of not resolving issues, or will even tolerate ambiguity and go their separate ways.” So instead of a culture of teamwork, there was too much kingdom-building and too little communication, often resulting in duplication of efforts and inefficient use of resources. In the fall of 2003, the design team decided to focus on transforming the organizational culture and structure. The goal was to revamp AG’s internal structure to match its external goals. A parallel effort to improve AG’s resource allocation methods addressed the shortcomings of the cost-plus budget process by initiating Meyer’s version of activity-based costing. Strathdee says the RoadMap team was nervous at first about a cultural makeover, because it’s hard to change people’s feelings and opinions. But Meyer encouraged them to focus on behaviors rather than attitudes. “When we thought of culture as behaviors, we thought, We can address this,” Strathdee recalls. The team worked its way through a list Meyer compiled of 13 cultural principles common to effective organizations, including good interpersonal relationships, integrity, teamwork and making commitments that can be kept. They modified them to align with AG values. (Instead of respecting the devil’s advocate, for example, the AG version recognizes “those presenting contrary views.”) The resulting 42-page document, which is interspersed with supporting biblical quotations, outlines specific behaviors that are expected of all AG employees. That kind of cumbersome document is hard to read to the end, much less inculcate into an organization. But in AG’s case, a teaching team rolled out each principle in mandatory one-hour sessions every three weeks. By November 2004, the culture change roll-out was complete, and Strathdee and his colleagues were already pointing to benefits, such as more productive meetings and better communication among managers. Sallee says one major impact of the culture effort is that AG’s executive suite is more open to dialogue. “We’ve always had an open-door policy, but people now feel like they can really go to that open door,” he says. At the Gospel Publishing House, the new atmosphere of teamwork has made it possible to roll out new products, such as a Christian comic book line and a sports camp curriculum, in record time. A subcommittee on organizational structure, charged with recommending an ideal structure for AG and reviewing its workflows, began meeting in early 2004. After studying Meyer’s building blocks for organizations, the committee proposed a new configuration for the top reporting relationships at AG. Enterprise-wide structural changes have yet to be made, but Strathdee has already applied some of Meyer’s advice within the IT group. Meyer recommends coordinating around specialties instead of around products; Strathdee separated network services personnel (engineers and architects responsible for innovation) from operations center staff (charged with maintaining the system that automates the warehouse and shipping processes). “When you group people by specialty, their stress level goes down,” says Strathdee. “You can’t ask a person to innovate and make sure the network never goes down. The concept underlying activity-based costing is straightforward: Desired outcomes and deliverables are quantified and listed on the budget. AG kicked off the effort to discard its old cost-plus budgeting mentality in January 2004, when Gospel Publishing House adopted Meyer’s Budget-by-Deliverables (BBD) approach. For the 2006 fiscal year budget, more than half of the AG headquarters will be using BBD, which builds budgets based on the cost of specific deliverables as opposed to traditional line items such as travel or training, says Clyde Hawkins, administrator of AG’s Division of the Treasury. A portion of everyone’s salary will ultimately be determined by deliverables, giving managers a strong incentive to look more carefully at how their employees are spending their time, Strathdee says. Working through a BBD worksheet led him to conclude that he needs 102 IT employees. (He’s now got 94.) He can see precisely which deliverables are stretching his staff; two more programmers were recently added to the current 18, for example. After identifying deliverables and the resources needed to deliver them, Strathdee’s next step was to “sell” those allocations to departments at a budget prioritization meeting in early January. “I went into the meeting with a lot of apprehension about defending our charges [for IT services], but that isn’t how the meeting went at all,” he says. Not only did managers purchase all of the IT deliverables offered but some found out about services that IT had been providing to other departments and wanted to buy them. “Our ultimate goal is to have a scenario where managers can have some choice in what services they are buying from us,” he says. Departments should be able to get nightly backup of sensitive corporate data on a remote desktop, for example, as long as they’re willing to pay a premium. Strathdee knows that making people accountable for the costs of the services they use will encourage thriftiness. Sallee says the new budget process will lead to major cost savings. But that’s not the biggest benefit from AG’s organizational revamp. “The most important thing is that 10 to 12 of the key managers will sit down and develop priorities. We’ll have more meaningful, open dialogue, but it will be collective rather than individual,” Sallee says. And for an organization once known for kingdom-building, a collaborative approach is something of a miracle. Senior Editor Alice Dragoon can be reached at adragoon@cio.com. This is unrelated to your post. It’s a great place to read about AG History and Pentecostal Evangel magazines since the 1910’s-20’s. I like the Donald Gee and Smith Wigglesworth. Yes! I have been to AGHeritage’s website. The A/G archives is doing a really good job of getting A/G and early Pentecostal history digitized and online. I love those guys in the A/G history department (A/G Heritage). They are never afraid to take an unflinching look at the real men and women who started this movement. Sounds like the Vision for Transformation is on-track at the General Council level, but I hear different things at state levels. Take South Carolina for example, where the District staff have been promoting the “renewal ministry” of Paul Borden (Building Healthy Churches)a guy who was a regional director of the American Baptist Churches USA. Mr. Borden lead 200 of the churches in his region into dissafiliating from their denomination under the guise of a lax stand on homosexuality. Paul Borden’s book, Hit the Bullseye and his seminars are being promoted to AG pastors across the state. Paul Borden is also working with 30 churches in New Zealand….who my guess is, will soon dissafiliate with their parent denomination. I agree we need change. I’m for change, growth and renewal….but I wonder at what price?